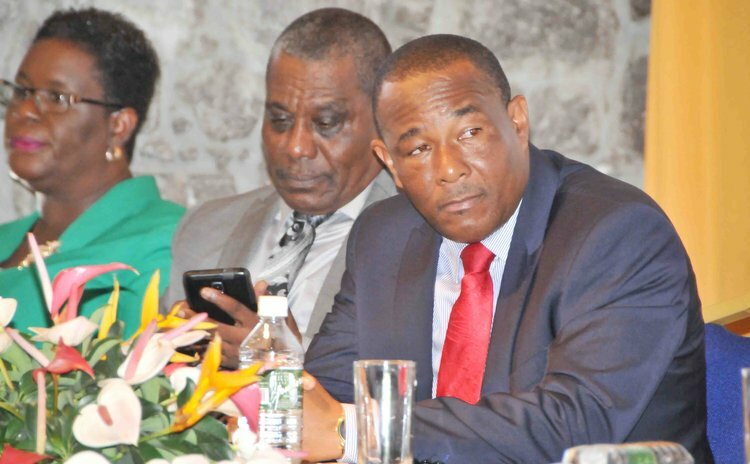 While the Dominica Agricultural Industrial and Development Bank (AID Bank) boasts of record profits for 2015, the board is apparently getting ready to get rid of its manager. Sources tell the Sun that manager Julius Joseph Corbett's three-year contract may not be renewed when it expires on 7th May 2016 and though Corbett has formally expressed interest in renewing his contract, the Board of Directors headed by Martin Charles has, so far, not responded. Corbett, a former General Manager of the National Bank of Dominica (NBD) began duties as general manager of the AID Bank on 7th May, 2013 taking over from Kingsley Charles Thomas, a Jamaican consultant. In his address to the AIDB's annual general meeting at the Fort Young Hotel on Wednesday last week Board Chairman Charles gave several hints that there could be changes in management at the AIDB. "While we are reporting a relatively good year, the future outlook is less encouraging, threatened by some loans that sit on the horizon of non-performing that will make our task more difficult," Charles said. He was apparently referring to additions to non-performing (NP) loans totaled EC$22.46 million in 2015 or 13.82 % of outstanding principal. NP was EC$17.16 million or 10.73 % of total principal in 2014. In his address Charles continued to indicate that there could be changes in personnel. He added: "We need to do much more to live up to our mandate…we will need to be able to handle more complex financial transactions and instruments". Charles continued: "Institutional efficiency is critical in driving the achievement of the bank. I want to assure you that as Chairman, I will drive needed reforms to achieve greater institutional efficiencies and effectiveness"
Charles argued that the AIDB "must become more nimble" and he contended that "there are way too many dysfunctional processes that simple clog up the effectiveness of the bank." According to the report, AIDB recorded a net profit of EC$2.69 million for the financial year ended June 30, 2015. This figure was 3.24 percent less than the stated EC$2.78 million net profit recorded in 2014. "This is the bank's second largest net profit after the restated figure for the year ended June 30, 2014 which was the largest in the bank's 44 year history," Charles said. For the 12 months under review, the bank approved 411 loans with a total value of EC$28.92 million representing an increase of 7.44 percent as compared to the previous year when EC$26.92 million in loans were approved. Under Corbett's management, the expenses of the bank for the year under review was EC$4.47 million, that is 7.58 percent lower than the previous year's figure of EC$4.83 million. Staff expenses of EC$3.68 million decreased by 10.32 percent, administrative expenses of EC$1.58 million decreased by 6.41 percent and total operating expenses of EC$11.25 million were 6.98 percent less than EC$12.09 million recorded in the previous financial year.